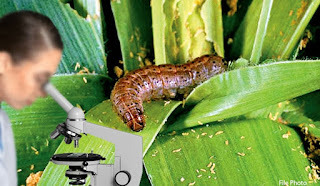 The Crop Research & Development Institute has commenced research on the use of microorganisms for the control of the fall army worm or "Sena Caterpillar" infestation which is destroying the local crops in many areas. Accordingly, they plan on propagating the microorganisms that would destroy the fall army worms and releasing them to the affected areas. The most severe damage has been caused to maize and paddy crops. Due to the fall army worm infestation, the maze and paddy farmers are facing great difficulty. According to the chief Entomologist of the Crop Research & Development Institute S.S. Weligamage, several measures have been taken so far to control the fall army worm infestation.